A new concrete planter in a garden area adds an attractive and durable place to grow either annual or perennial plants. 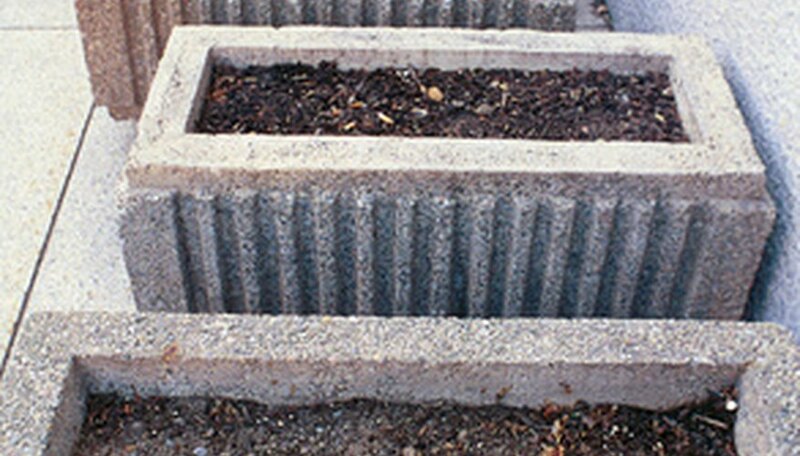 If your new planter looks too new and isn’t blending with the rest of your garden decor, age concrete planters with a mossing technique that introduces live moss spores to the concrete. After you apply the moss spores, they will begin growing quickly to cover your concrete planters attractively. In only a few weeks, your planters may appear as if they’ve been sitting outside in your landscape for decades. Mix the plain yogurt, the moss spores and the water in the blender and blend the ingredients for 30 to 60 seconds. Spread several layers of newspaper out onto a flat work surface and place the concrete planter onto the newspaper. Paint the moss and yogurt mixture over the outside edges of the concrete planter, covering the concrete generously with the liquid. Leave the concrete planter sitting on the newspaper while the mixture dries on the concrete. Move the concrete planter to its regular location. A shady location will facilitate better moss growth. Water the plant growing inside the container regularly to help the concrete planter stay moist. Spray the outside of the container with a fine mist of water every few days to keep it moist. Watch for the moss to begin growing within one to two weeks. The moss will quickly cover the outside of the concrete container. Find moss spores at garden centers or at online retailers.